Ice cream, incidentally, isn’t something I feel needs to be constrained to the summer months, but I’m definitely more inclined to want something cool and creamy for dessert when its warm outside. 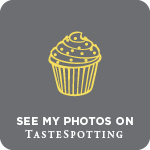 When Oreo got in touch while I was on holiday in Italy to see if I could develop a recipe using their brand new Mint Oreo flavour, I knew that an icy treat was on the cards. If you’re looking for an easy summer dessert that will appeal to children and big kids alike, these three ingredient popsicles are just the ticket. Crushed Mint Oreo cookies are folded into coconut milk with a dash of vanilla before being frozen til firm. 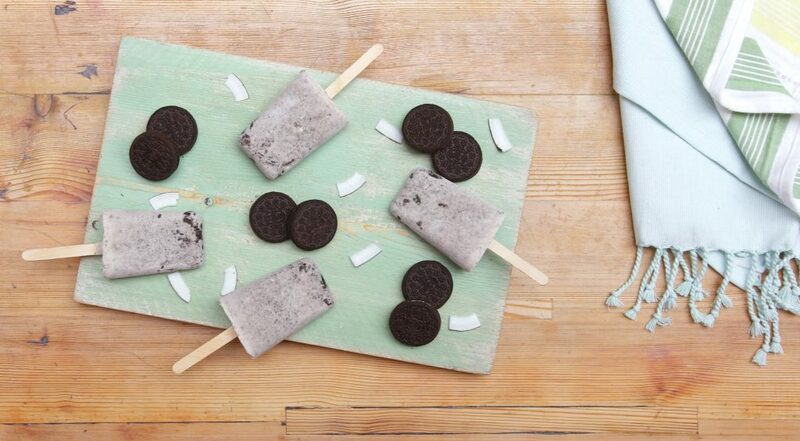 Coconut milk stays nice and creamy when frozen, making it a tasty and healthy alternative to dairy and a whole Oreo cookie hidden in the centre of each popsicle makes for a fun – and delicious – surprise as you take a bite. 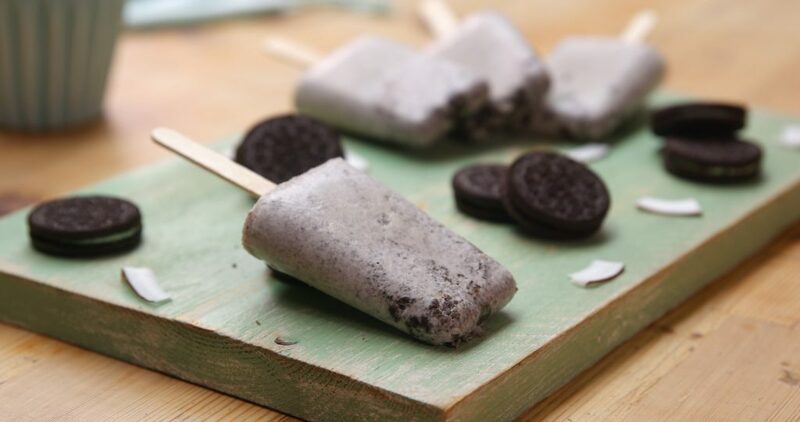 The brand new Mint Oreo flavour makes for wonderfully cool and refreshing popsicles, but this recipe can also be made with the new Strawberry Cheesecake Oreos. If making the latter, try folding in a handful of fresh strawberries for an even more luxurious alternative. If you don’t have popsicle moulds, try freezing the mixture in little plastic glasses. A super simple frozen dessert that comes together in minutes - perfect for sunny days and school holidays. Disclaimer: A serving of this recipe should be seen as a treat – best enjoyed occasionally as part of a balanced diet. Set aside 5 Oreos. Place the remaining 9 Oreos in a plastic sandwich bag and bash with a rolling pin until you have a dusty mixture with some larger chunks of cookie. In a medium bowl, whisk the coconut milk, honey and vanilla until smooth. Stir in the crushed Oreos to combine. Pour a small amount of mixture into the bottom of five Popsicle moulds. Top each one with a single Oreo, then pour over the remaining mixture. Insert a wooden lolly stick into each mould then freeze until firm, at least four hours. When ready to serve, dip each Popsicle mould in boiling water for 5 seconds then unmould. Serve immediately. Popsicles will keep in the freezer for up to two weeks. These look so yummy! Perfect for these dog days of summer.